And then there was the time that my mom REALLY got me. I was driving home from work (I typically work in the late afternoon/evenings) and called to tell me that she had made dinner for me and gave it to my husband when he had come to pick up the kids. I was very excited because when I had dropped the kids off I noticed that she was preparing one of my favorite dinners, a certain chicken casserole. I was really looking forward to it as I got home. I found some tupperware in the fridge, opened it up, and found the container was filled with … octopus. Seriously. Octopus. Small. Gross. Smelly. Octopus. I almost puked. Another April Fools prank I was ALWAYS remember. A couple years ago one of the tricks I had planned backfired on me and I ended up playing a joke on myself! I placed a color dot tablet (like for the bath tub) in the screen of the bathroom sink faucet to turn the water a different color when the water is turned on. (I saw the idea here.) The trouble was I should have not used the entire tablet because it was too large. This caused me not to be able to securely tighten the screen back on … but that didn’t stop me from trying out the water. It ended up spraying all over me and the bathroom. I ended up laughing hysterically at myself … and having blue hands for a couple days! When you wake up your child have a concerned look on your face and ask them why their face is blue/green/purple-with-polka dots (you choose, have fun!). Tell them to hurry and go look in the mirror. Then say, “April Fools”! If April 1 happens to fall on a weekend or spring break, tell them they have school that day. Last year I my son’s first day of spring break fell on April Fools. I woke him up by telling him I got a call early in the morning (just like we do when we have snow days!) saying that spring break was cancelled and that he’d needed to get ready for school. He actually started crying. I felt kinda bad … but is was pretty funny. And I told him very quickly that I was just joking (and gave him a big hug)! 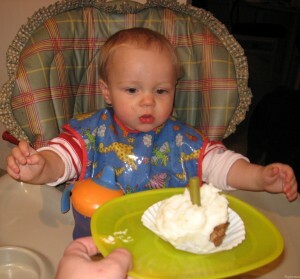 Meatloaf Cupcakes with mashed potato “frosting” and a green bean candle (this was my son’s FIRST April Fools!). 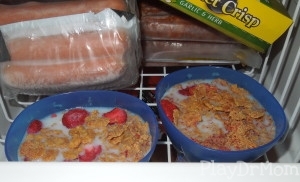 Frozen cereal (just pour the cereal and milk the night before and put it in the freezer!) The look on the kids face when they try to put the spoon in is priceless! I told my kids I found a great summer camp to send them to … Adventure Getaway Chore Camp! You can get the brochure here. 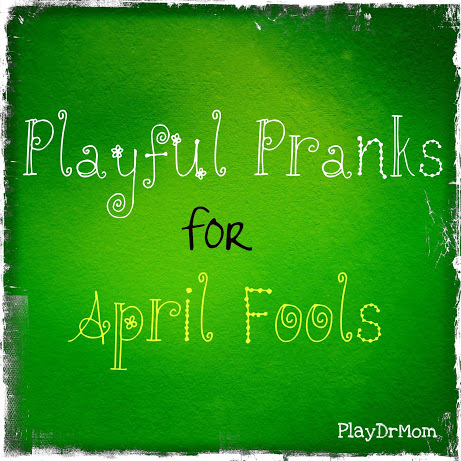 And for even more great ideas check out my April Fools & Playful Pranks Pinterest board! Hahahahahaha!! What fun! I’m digging the frozen cereal, I’ll keep that one in mind for when my littles are older. 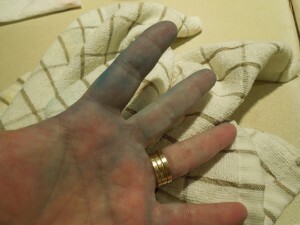 I am giggling at your blue hands . . . mostly because I would totally do that too! 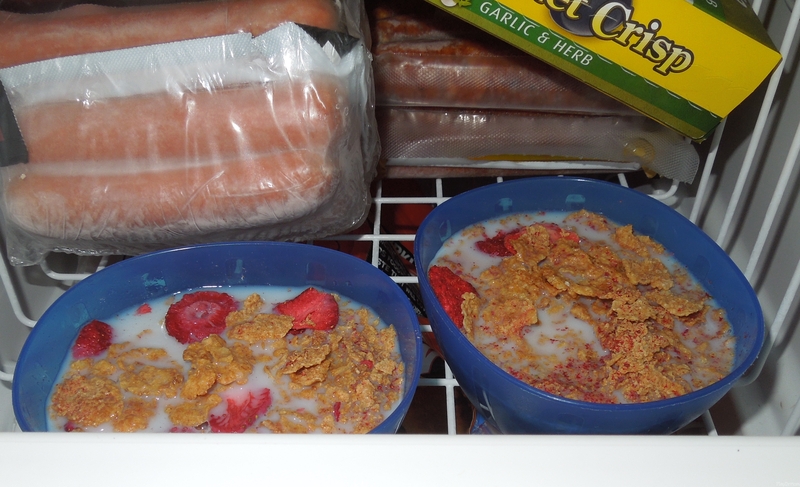 The frozen cereal is something I need to remember for next year. 🙂 Thanks so much for sharing this at Stress-Free Sunday!